Purpose is making copy of media (drive, disk) in form of image file, and reverse operation - copiing from image to media. Such image files are useful as backups, as images suitable for diverse emulators. Program works with hard drive category of medias - there belong: IDE hard disks, PEN drives, diverse FLASH storage cards as Compact Flash - they attach usually via some USB card reader to PC. Refresh button is for forcing detection of all drives again - in case you connected/disconnected something. Not likely will be needed - autodetection will care about it. Under it you may set offset from start of disks and count of sectors if want to read/write only segment of drive. Selection of drive is by simple click on it's line in list window left. Then program attempts to detect used filesystem on that media - 'DOS mbr' means usually that it is hard disk in PC - so better don't write to it! 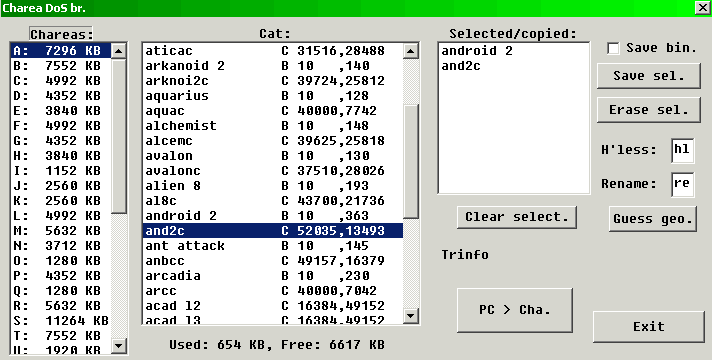 PLUSIDEDOS is used by Spectrum +3e and some other clones. 'Charea DoS' is mine system, with 36 areas by begin letter A-Z, 0-9. With click on 'Open image file' you may select image file instead drive. You may then perform even conversion RAW-HDF or HDF-RAW. Just click after selecting image file on 'Read from drive', and program will convert. Program gets CHS parameters from hdf files, but for RAW it is not possible (except when Charea DoS FS is on, see below - Guess geo.) 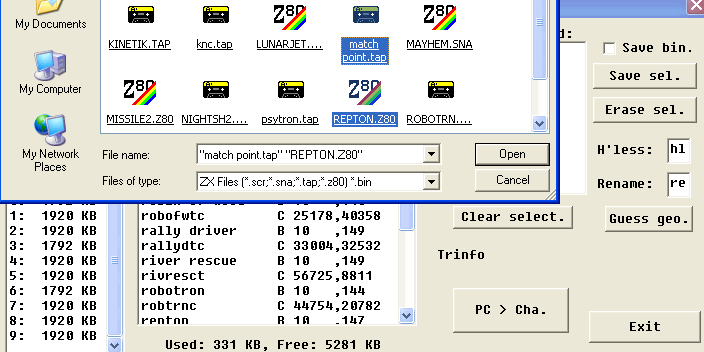 , so enter them manually by need - in case of (older) image files for usage with CHS ROMs. Speed: it should work pretty fast with USB 2.0 card readers. Speed depends much from used media. 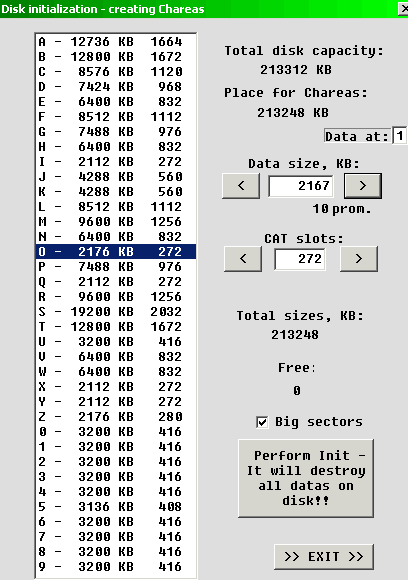 Newer CF cards can read over 2 MB/sec. Write is usually slower 2-3 times than read. New PEN drives are even faster - read over 5MB/sec. With click on button with long text, and confirmation disk/image will be initalized and ready for usage. You may imediately check it by entering 'File transfer' .